Aspen Boutique, formerly Aspen Traders, has been a shopping delight for more than 27 years at the corner of Douglas and Oliver in College Hill. The iconic lavender blue building across from Lincoln Heights Village opened in 1987 when James and Monica Smits created a unique store with fine clothing, gifts and jewelry. Husbands, brothers and boyfriends have long known about Aspen Boutique as the place to go for gift-giving advice for birthdays, Mother’s Day, Graduation and holiday gift giving. 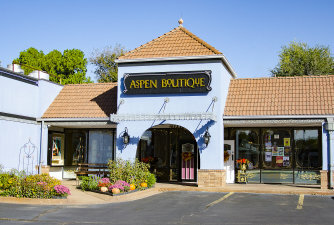 Today, Aspen Boutique is usually described by its loyal shoppers as a total experience. Where it’s less about a silken scarf, unique pendant or special dress, but all about the women who wear them and how they feel in Aspen’s unique outfits. This Wichita specialty store is staffed by veteran fashion helpers who know their customers, and often their entire families by name. One of the most treasured gifts for any occasion is an Aspen Boutique gift certificate. Every purchase is meticulously gift wrapped in the store’s trademark gift packaging. Aspen ‘lifers’ can spot an Aspen Boutique gift from miles away. It’s not unusual for an Aspen Boutique’s customers to be second and third generation shoppers! James and Monica comb markets all over the country and abroad to bring back custom, yet affordable jewelry, belts, shoes and accessories. Their clothing lines always include the best special occasion dresses and outfits in the city. Be sure to sign up for our newsletter via the link to the left, and stay tuned for sales and special trunk showing events. And don’t miss our yummy bath and bedtime products, and bed time apparel.